This package has been formulated by patients of mild to chronic Cold Sores who like so many have had little success with pharmaceutical solutions. Cold Sores are unfortunately caused by a Virus - Herpes Simplex - which like most viruses cannot be killed directly from any treatments. Rather our treatment is aimed at depriving the virus of its basic resources to replicate while supporting the immune system to respond. 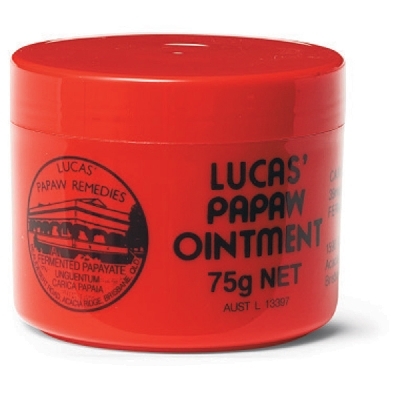 Lucas Papaw Ointment provides topical relief and basic nourishment to the lips. Lysine Lip Clear floods your body with L-Lysine which reduces the bio availability of L-Tyrosine. The the Virus needs L-Tyrosine to replicate while the body can continue normally using either L-Lysine or L-Tyrosine. From experience no solutions we have tried have offered a quick solution to cold sores. They can be painful - and this treatment pack is designed as a herbal alternative to antibiotic and pharmaceutical solutions. Nothing - including this treatment will heal an cold sore overnight. This treatment is designed to help relieve, reduce the severity and duration. This product was added to our catalog on Saturday 04 August, 2012. While stocks last.